On the rare occasions I get to peruse paper and ink books in a brick and mortar bookstore, after a brief flirtation with the cover and blurb, I will scan the table of contents, then gently – for the book is new, the clean pages crisp – thumb through the final leaves until I locate the index, where, if I am familiar with the subject matter, I expect to find, at the very least, the usual suspects. Their absence might well be symptomatic of more profound flaws between the covers; for example, a book titled The History of Psychology, whose index fails to reference, say, Freud, Jung and Mary Whiton Calkins, could safely be passed over in favor of something better. Once a book is finished, its index remains invaluable in tracking down partially or half-remembered facts and phrases. In many digital books, the index has been replaced by search but, whereas a full-text search of a digital book often requires one to know precisely what one is looking for, in an alphabetical subject index, a half-remembered name, or even the first letter of an otherwise forgotten word, is usually sufficient. It is for this reason that the designers and editors of digital books should not be in a hurry to do away with the index, for it remains an indispensable, simple and intuitive means of making texts, most especially lengthy texts, more accessible. The libraries of Alexandria were home to half a million books or more. The two libraries were destroyed by war in the first century BC and by religious zealotry in the fourth century AD. Scrolls were not ideally suited to indexing and it was not until the introduction of the codex, with its intrinsic sections, or pages, that the potential of indexes could be fully explored. Surprisingly, the codex’s greatest asset, the discrete page, was the feature that early indexers failed to exploit. Only later, with the introduction of sequential page numbering, would the index really come into its own. The earliest alphabetical subject index dates to the sixth century, an anonymous Apophthegmata, or collection of quotes and aphorisms, from various Greek fathers. In the eighth century another alphabetical subject index of sorts is to be found in the Byzantine manuscript, Sacra parallela, a florilegium, or collection of quotes from the Bible and early Church Fathers, compiled by St. John of Damascus. Another form of index, popularized later in the Middle Ages, was the concordance. The first concordance, for the Bible, was compiled under the direction of the Dominican friar, Hugh of Saint-Cher, and completed in 1230. The Biblical concordance, an alphabetical index of words, proved especially useful to medieval theologians and Biblical scholars. At about the same time, the Bible was divided into chapters, popularized by the work of the English Cardinal and Archbishop of Canterbury, Stephen Langton. It was the Bible’s division into smaller chunks, or chapters, that made indexing more workable. Aside: Strong’s Concordance (1890) is an exhaustive concordance of the Bible, indexing every single word of the King James translation. It does not require page references as locators, using instead the Bible’s books, chapters and verses. However, the alphabetical subject index is seldom found in medieval manuscripts. Not until the fourteenth century, when, incidentally, the Vatican began to use alphabetical indexing in organizing its archives, do we begin to witness a tentative rise in the use of indexes. Of the indexes found in fourteenth-century books, some appear to be in the hand of a second scribe – or more likely the unpracticed hand of the book’s owner. But, all the same, the increased occurrence of indexes suggests that their value was at last beginning to be appreciated. An example of stichometry in the Clarke Codex of Plato’s Dialogues, copied in 895 AD. Lambda, the eleventh letter of the Greek alphabet, indicates line 1,100. The line-numbering is undoubtedly copied from a much earlier manuscript. Bodleian Library, Oxford University. The preface also includes a note on how to use the index. The indexer, chose letters over numerals as his locators: when the alphabet (A–Z) is exhausted (with the addition of a Tironian ‘ampersand’ and the backwards capital C, an abbreviation of the Latin prefix, con), the index turns next to two-letter combinations, beginning with AB–AↃ, BC-CↃ, CD–CL, for a total of 80 divisions. First text page of Fust and Schoeffer’s 1467 edition of St. Augustines’s, De arte praedicandi. Note the guide letters (a, b, c, d, e) printed in the inside margin, used as locators in the index. First page of index from Schoeffer’s 1474 edition of Speculum aureum, printed in Mainz. Of particular interest in early printed indexes are the solutions to linking index entries to their sources within the text. 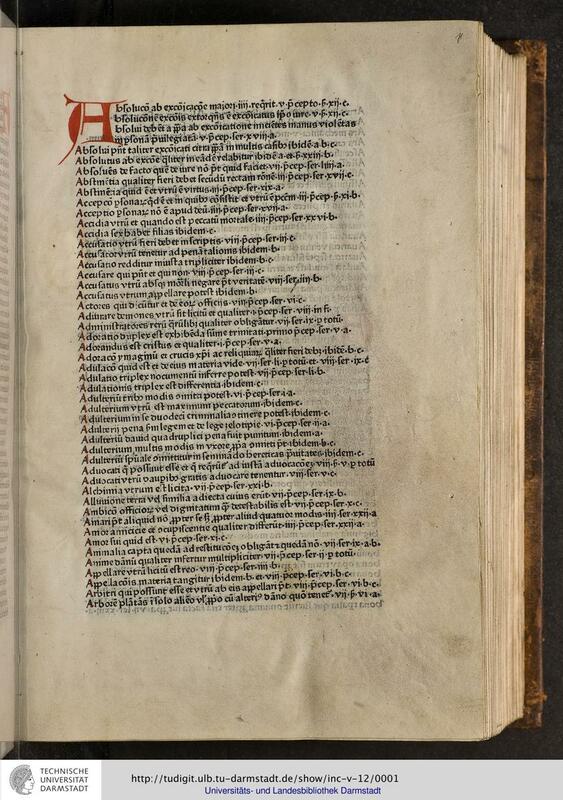 Peter Schoeffer, now printing alone, after the death of his partner Fust in 1466, printed the first edition of Henricus de Herpf’s Speculum aureum. This substantial book of 811 pages was printed in 1474, some seven years after the St. Augustine and it demonstrates that Schoeffer was still grappling with how best to present the index. The book opens with an index of 22 pages, not comprising a list of words but instead sentences and phrases. In the absence of page numbers, the index makes good use of the book’s natural divisions: first the index references one of the book’s major divisions, one of ten commandments, each introduced by a large, rubricated initial of six lines; next, the index references one of 213 sermons, introduced with a smaller, usually, four-line initial. Each index entry concludes with reference to a guide letter printed in the inner or outer margin. Second page of index from Shoeffer’s 1474 Speculum aureum. Each entry adheres to a reference system of Commandment > Sermon > Marginal Catch letter. So, for example, the first entry under B, reads: “baptismi forma qualis est. i. sermon xvi. c.”, with, of course, the concluding “i. ser. xvi. c.” acting as the locator, referencing the first Commandment, Sermon 16, guide letter, C (in the margin). You can test the index for yourself with the digitized copy of this incunable hosted by ULB Darmstadt. One of the greatest drawbacks of early indexes is the absence of page numbering. Printed page numbers (or foliation) were first introduced in 1472 by Arnold Ther Hoernen in Cologne, in the first edition of Werner Rolewinck’s Fasciculus temporum (literally, ‘bundles of time’). However, printed page numbering was not broadly adopted until the following century. One of the first books to combine an index with foliation, or page numbers, was another edition of the hugely popular Fasciculus temporum. The 1481 edition, printed by Erhard Ratdolt in Venice, opens with a three-column, fourteen-page alphabetical subject index with references to printed page foliation on the recto side, centered in the top margins. First page of the index from Erhard Ratdolt’s 1481 edition of Werner Rolewinck’s Fasciculus temporum. Image courtesy of Biblioteca de Andalucía. In this particular copy, the rubricator, although not particularly accomplished, is not lacking in enthusiasm. Known from antiquity and used sporadically throughout the Middle Ages, it was not until the Renaissance and its appearance in print that the index was made a permanent feature of the book. After its first tentative appearance in print in 1467, it reappeared sporadically until its more widespread adoption in the sixteenth century. Today, the index remains an indispensable tool for readers, students and scholars alike. Header Image: Virgil reading his Aeneid to Emperor Augustus and his sister Octavia; Jean-Joseph Taillasson. Header Typeface: Quarto by H&Co. And don’t forget to sign up to our new monthly newsletter, The Month in Type – it’s free and fantastic.